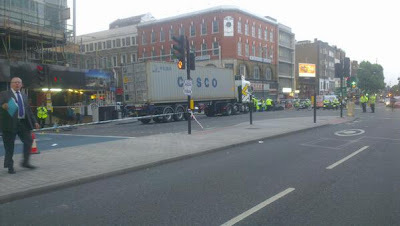 Two Wheels Good: A woman riding a Boris Bike killed by a lorry on Boris's Cycle "SuperHighway" 2. Paint on the road is not cycle infrastructure; TfL and the local councils need to confront this before even more Londoners are killed. 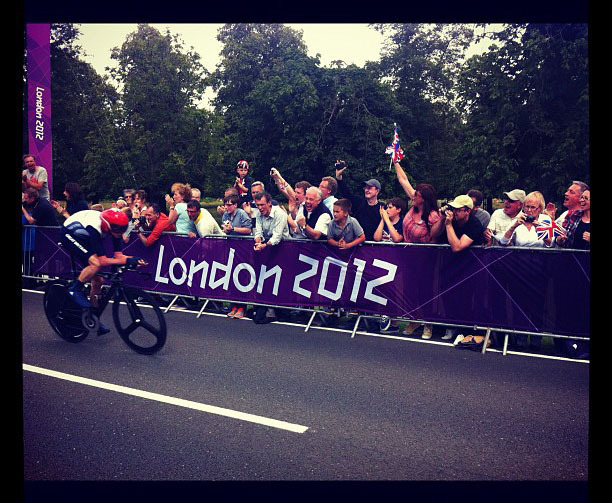 Cycling as a form of transport in London and the rest of the UK. Do read if you cycle from A to B or are interested in using a bike to get around! 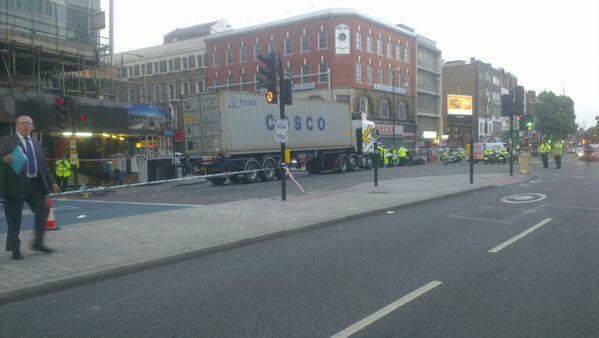 A woman riding a Boris Bike killed by a lorry on Boris's Cycle "SuperHighway" 2. Paint on the road is not cycle infrastructure; TfL and the local councils need to confront this before even more Londoners are killed. Last night we heard the tragic news that a woman riding a Boris Bike on one of the Mayor's supposedly top-quality Cycle "SuperHighways" was killed by a collision with a lorry which in all probability drove into her. This is the first time a Boris Bike user has been killed in London, but it isn't the first death along the route of Cycle Superhighway 2 (CS2). Very, very sad. 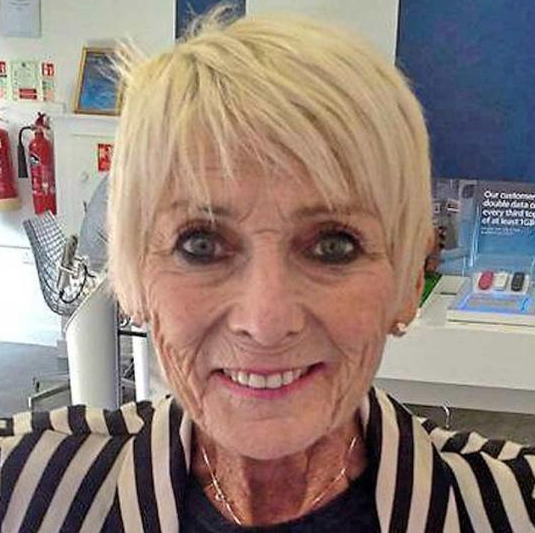 This recent and shocking death, the first on a Barclays Cycle Hire Bike could be a political catastrophe for the Mayor, Boris Johnson. You can interpet the story in many ways, but one of them is surely that of a woman lured by TfL's copious and expensive advertising of 'cycling' into riding one of Boris Johnson's new Barclays bikes, expecting to be safe on Boris Johnson's 'international standard' Cycle Superhighway 2, and then being tragically killed because the Cycle Superhighway is in fact a death trap where cyclists mix freely with aggressive motorists and HGVs that can, and do, kill them all too easily. This death also comes only a few days after TfL released data showing that the total number of people seriously injured or killed on bikes on London's roads last year was up 60% on the long term average 2005 - 2009. UK road casualty figures for those not on a bike are at a record low, but this figure masks the fact that cycling road casualties are increasingly sharply. In fact, cycling fatalities are going up more quickly than the increase in riders on the road. Cyclist deaths rose 10% during 2012, with serious injuries up by 4%, the latter increasing for the eighth consecutive year. 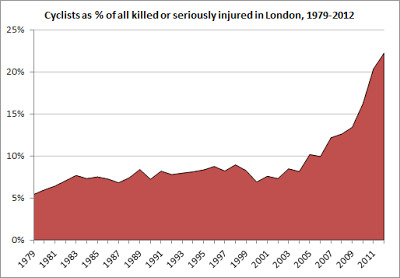 As this graph shows, cyclists are coming to take up an increasingly high percentage of all those killed or seriously injured in London. Motorists and pedestrians are getting safer, but cyclists are getting far more vulnerable. The main reason for this is London's stunning lack of safe bicycle infrastructure. Segregated tracks like Tavistock Place, or the protected contra-flow on King Street in Hammersmith, are notable for their scarcity. Cycle "Superhighway" 2, like most of the cycle "superhighways", is simply some blue paint on the road where cyclists and heavy traffic mix freely. Picture of CS2 outside Aldgate (near where this woman died) from June 2013, courtesy of Cyclists in the City. The lorry driver overtook these cyclists on a corner, putting them both in a life-threatening situation, stuck between an iron fence and a 30-tonne vehicle. The driver did this because the road is made up of 'general traffic lanes' that encourage lorry drivers to overtake cyclists with 50cm to spare, putting thousands of lives at risk everyday in our capital. The easy solution is to provide a cycle-only lane that those driving motorised traffic cannot enter. It is easy to see from the above photo just how dangerous it is to mix cyclists and heavy traffic. Fatalities can, will, and do happen. Enough is enough. 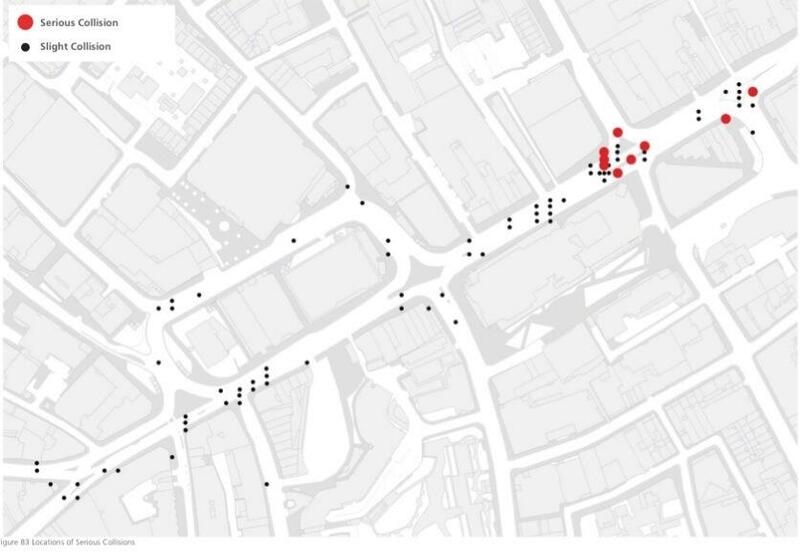 And yet, at the City of London Cycling Forum last Tuesday officials representing the City of London explained their plans to spend over £12 million redeveloping the Aldgate gyratory, and in the process delivering just 70m of segregated bike lane. That's right, £12 million for 70m of actual protected space in which tragic deaths can no longer occur. What was just as concerning was that both of the City of London and TfL are using the weasel words - this route is for the 'experienced commuter' - to avoid putting in any decent infrastructure to fatal routes like the CS2. The problem with this type of thinking is that if you don't make cycle routes safe then people die on them. It doesn't matter if they are 'experienced commuters' or 'first-time cyclists'. 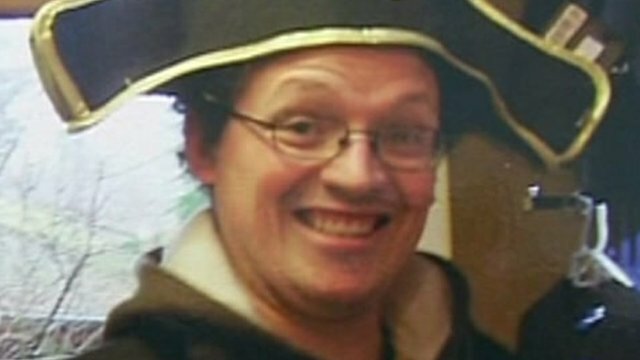 Mixing humans on bikes with steel-clad HGVs is fatal. I pointed out to the City officials that rather than focusing on a hard to understand network of routes for cyclists of 'different abilities', wouldn't the simplest thing to encourage cycling be to make those routes that cyclists currently use much safer than they currently are? Countless surveys tell us that the primary factor putting people off cycling is that they think it's too dangerous. 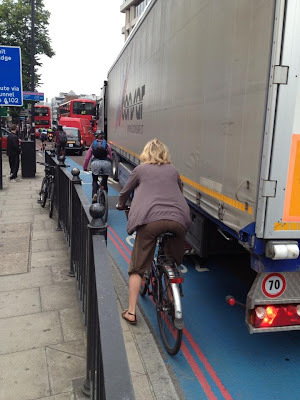 Deaths, like the one on Boris's Cycle "SuperHighway" last night, are only going to further reinforce this view. Surely the best way to encourage cycling is to take routes that already have heavy cycle traffic, like Cycle "SuperHighway" 2 or London Bridge, and create proper segregated infrastructure that means that needless and avoidable deaths like these can become a thing of the past. If the woman cycling on a Boris Bike on CS2 last night had been on an actually segregated lane (as pictured here, 9th Avenue New York) the fatal collision with a lorry would have been almost impossible. And yet, instead we find local officials planning 'Quiteways' along roads that continue to contain dangerously and intimidatingly large volumes of through traffic. 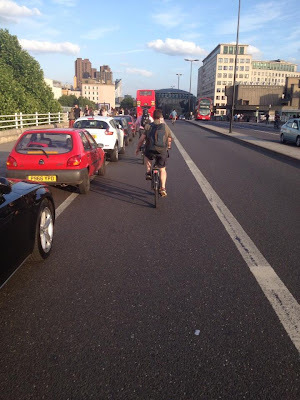 And, there are no immediate plans to put proper protection for cyclists onto extremely busy cycle routes like Waterloo Bridge where in rush hour over 40% of the vehicles are bikes. 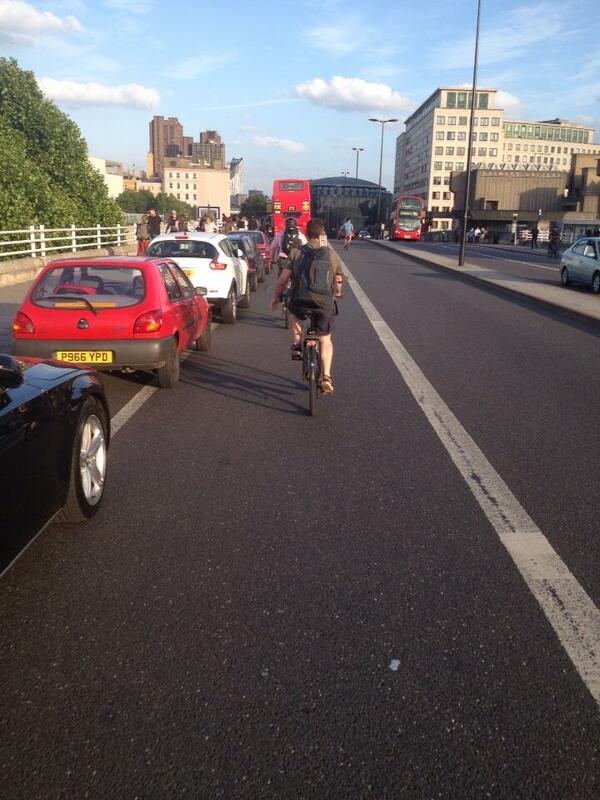 Waterloo Bridge has a cycle lane but it's actually a car park (can you see the outline under all those parked cars?). This is why we need segregated, physically separated cycle lanes on these busy routes. And we need them now before more Londoners die. 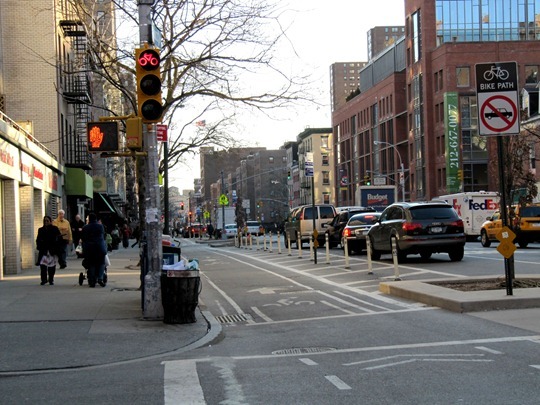 Photo courtesy Cyclists in the City. TfL and London's Councils need to put their heads together and sort all the already busy cycle routes in London, making them subjectively and objectively safe. If they spend their precious time elsewhere they're only going to have more deaths on their hands on heavily cycled routes that are supposed to be safe. Like CS2. Like CS7. Like London Bridge. And those working in transport planning in London should be forced to get on a bike and cycle our 'Superhighways' like the deadly, fatal CS2, before they come up with schemes that cost £12 million and deliver a laughable 70m of segregated cycle track. Transport planners need to have ridden a bike on London's busy streets before they create computerised animations (as the City of London team did at the most recent Cycling Forum) that show computerised HGVs turning left over computerised cyclists, and computerised cyclists calming filtering through a 0.5m gap between a stationary bus and a stack of cars waiting at a red light. It is not safe for cyclists to be driven over by HGVs or filter through 0.5m gaps. It is ridiculous that anyone could think in this way. Yet this is how local transport officials still plan for cycle use. Hence only 70m of segregated space in a £12 million redevelopment. 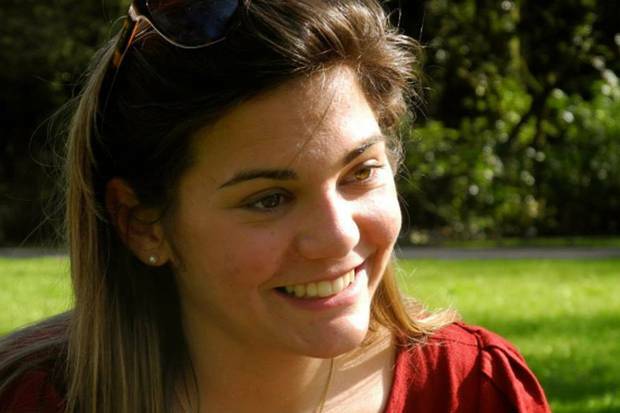 Philippine De Gerin-Ricard, a 20 year old French student, was killed by a lorry driver while riding a Boris Bike along one of Boris Johnson's Cycle "SuperHighways" that is now being investigated by police for being of a criminally poor design. Photo courtesy Evening Standard. thanks for the detailed article. Tfl/London Assembly/Boris need to sort things out. I would add that the 70m of cycle track in the plans are part of the City of London "ring of steel" and is only 1.5m wide. Presumably the narrowness of the cycle track is to force single-file cycling for police inspection (should one of those checkpoints ever actually be manned). So it's not for the benefit of cycling, but for the City of London Police. I'm not sure 2005-2009 qualifies as a "long-term average" but in a way it is more telling - it is the period of the last mayor's second incumbency, and cyclist/pedestrian casualties had been falling over that time. What has happened since is the arrival of a new mayor, Boris Johnson who, while purportedly pro-cyclist (and he is a keen "fietser", utility cyclist himself) has been pursuing a shamelessly pro-car transport policy. Network Assurance, or "smoothing traffic flow", "journey time reliability", SCOOT, countdown timers on pedestrian crossing lights, reduced pedestrian green-man phase times, opening red route bus lanes to motorcycles (in my view the least of his sins) - the list goes on. Everything he has done is to reverse the presumptions in favour of cyclists and pedestrians - weak as they were - espoused by Ken LIvingstone. What he has done for cyclists is frankly pointless and worthless. He has spent an obscene proportion of the available funds on two vanity projects - the cycle hire and the "super"highways - mainly to the benefit of a private company (a well-know bank) in its PR campaign, instead of on smaller and unglamorous real changes on the ground - more Tavistock Place schemes, for example. How on earth could the hire bikes cost so much, and how on earth could the smurfways cost so uch more per mile than Chicago is spending on proper physically separated cycle paths? I think we should be told. CS2 has a pretty good bit just after Bow (going towards the City) but the rest is just the odd advisory cycle lane and a bit of paint/ Now, you cannot get lost until just after Aldgate East, but to get there, you really are running the gauntlet. Traffic simulators should simulate the traffic that will actually occur, not the traffic as we'd like it to be -- so that leaves one failure in the *simulator*. After the virtual truck ran over the virtual cyclist, all traffic should have stopped flowing, tieing up traffic across that entire section of London. Cyclists *do* filter up 0.5 meter gaps, so the simulator should reflect that -- as well as tagging them "at risk" while theyre are doing so. 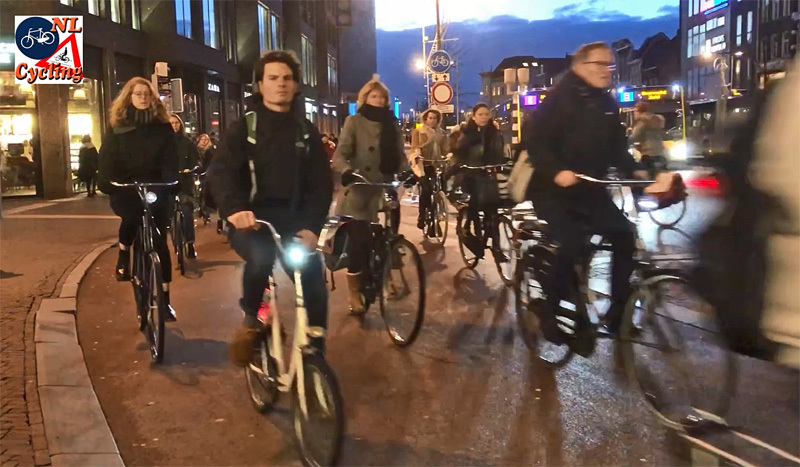 It would be interesting to find out of the software tracks "cyclists in dangerous/compromised positions", and campaign for this feature to be added if it is missing. I was a the City of London forum last week and left incredibly dispirited. It really was shocking just how far away current thinking is from what is needed (not sure why I was surprised) and the complacency of the Councillors and planning experts was terrible. 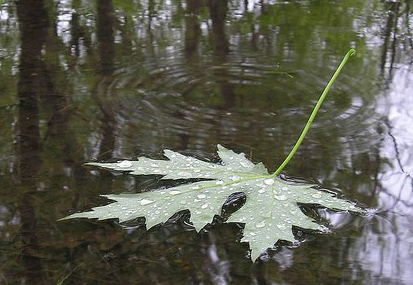 The designs for Aldgate look criminally inadequate in the wake of this tragedy. It's bad enough that current designs are discouraging cycling, but as you touched on, they are also actively designing in conflict. The junction of Mile End Road with Cambridge Heath Road and Sydney Street is crap for cars and a killing waiting to happen for any cyclist unlucky enough to attempt a right turn. I know as I came close to being wiped out a few weeks back. TfL sort the junction out and don't have opposing right turners fighting each other, put in some right turn lights and stop killing/injuring people. Do you support the creation of segregated cycle lanes on busy streets in the UK, physically separating cycle and motor traffic? Do you support a London-wide 20mph limit, excluding certain main roads? Are Kensington and Chelsea Council deliberately blocking TfL from segregating Cycle Superhighway 9 along Kensington High Street? Yes. 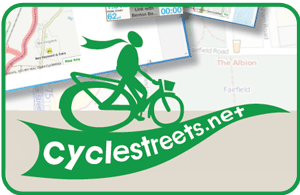 Andrew Gilligan's Cycle Superhighways need YOUR support! 10,000 Londoners take to their bikes and bring Parliament Square to a stand-still but Boris Johnson *still* doesn't get the message. 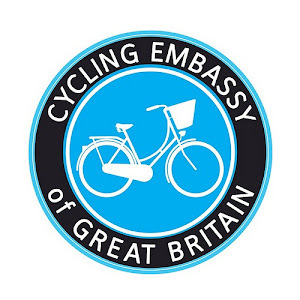 I'm a Londoner and wish it was easier and safer to travel around the UK by bicycle. Get on your bike; it's pleasanter, faster, cheaper, greener, freer, cooler than you think! 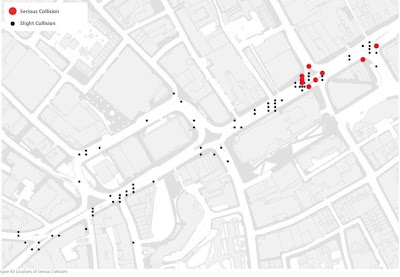 Beyond the Kerb | Trying to make sense of where the wheeled things live. Day 3 of 30 - went around the block. - Yep, I know it's kinda cheating, but it was really windy and really cold. It's all about the habit, right?